Now equipped AC the Treehouse has an expansive vaulted living area, including a kitchen outfitted with the latest stainless appliances, beautiful hardwood floors, in-floor radiant heat, and an entertainment center with a 55-inch LED Smart TV, direct TV, and a blu ray player. A wraparound deck has views of the mountains, and two sets of French doors invite indoor-outdoor living. There are three bedrooms, two with king beds and the master has a queen bed; two full bathrooms; and a den with two futons that can be used as an extra bedroom or a playroom that has a 37' LCD TV with a blue ray player and netflix streaming. A seven-person hot tub makes it easy to appreciate the abundant Southwest stars. It all adds up to a luxurious and comfortable home away from home, ideal for a big family or a group of friends. High efficiency Mini Split LG AC units have been added to the great room, master bedroom and downstairs den. These units are incredibly quiet due to a central compressor that is located outside the house. The two downstairs bedrooms didn't get AC units because they are already very cool due to being built below grade and they are right next to the downstairs den that has an AC unit. Privacy and views in a downtown location. Built up against a hillside with views of town and mountains with no houses out the back. 9 blocks from downtown, 1 block from natural food grocery store and other restaurants. Hundreds of miles of World Class single track mountain biking out the front door, ride or hike 200 feet straight to Horse Gulch single track without touching the pavement! Minutes away from quality sandstone rock climbing and bouldering, natural hot springs at Trimble. High efficiency Mini Split LG AC units have been added to the great room, master bedroom and downstairs den. These units are incredibly quiet due to a central compressor that is located outside. Accessible to guests upon request, great for storing bikes. Lots of room, immaculately clean and nicely decorated. Well done. Definitely a keeper. We loved our stay! The home is beautifully and comfortably appointed. We liked the location, tucked up against the cliffs. It's a twenty minute walk to downtown through the always lovely residential area. Couldn't have been nicer. Highly recommend. 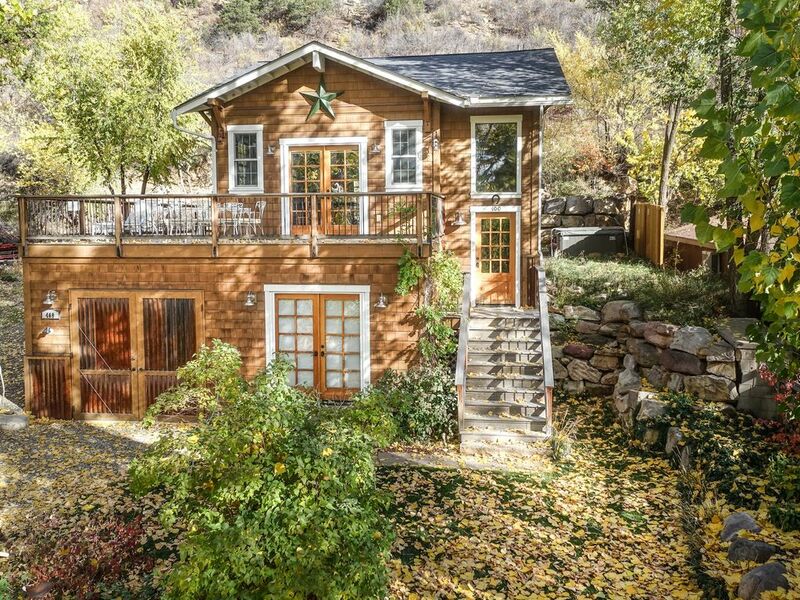 Close to downtown, Fort Lewis, and can ride to fun bike trails out the door. The Tree house was absolutely beautiful. The kitchen was well appointed. The open floor plan was perfect for cooking and visiting at the same time. The hot tub was a big bonus. The house was very clean and nicely decorated. Overall it was a lovely visit. Well maintained and beautiful house. Andrew was super helpful and made our stay awesome! Single track out out the front door that leads to Horse Gulch Trail head which is 200' away.